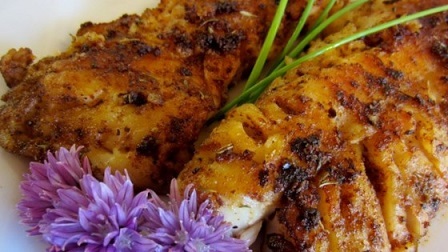 Catfish is a perfect partner for the bold flavors of this spice blend, but any thin, white-flesh fillet such as trout, snapper, or perch are worthy substitutions in a pitch. Don’t skip the lemon; it adds brightness and acidity to balance the fiery fish and buttery sauce. Stir together first 8 ingredients (through cayenne pepper) in a small bowl until well combined. Sprinkle fish with salt, and let stand 20 minutes. Drizzle with oil. Sprinkle fillets evenly with ¼ cup blackening spice mixture, pressing to adhere. Add butter to skillet; cook 2 minutes. Flip fillets and cook 2 to 3 minutes. Remove fillets to serving plates, and sprinkle evenly with fresh herbs. Serve with lemon wedges.